Who doesn't love an easy weeknight dinner? Something you can just throw together in less than 20 minutes and feel satisfied. Not that long ago, my go to dish for nights like this was a box of pasta and some jarred tomato sauce. However, after a visit to my Mommasita's and tasting her homemade sauce, I decided it was time I created my own version. Not only is making your own pasta sauce easy as can be but you can alter the recipe in tons of different ways and get new dishes every time you cook. Plus, it is SIGNIFICANTLY healthier making your own. The third ingredient in most jarred varieties is sugar! You might as well be eating a Snickers. Don't get me wrong. I love a good Snickers, but I would rather save my sugar intake for dessert. 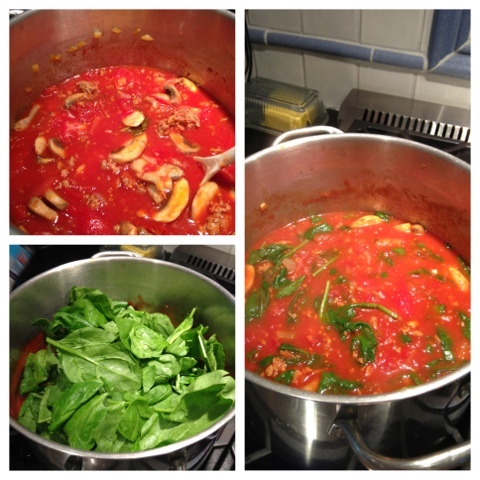 The recipe below is now my go to pasta sauce recipe. Despite being easier than dating Taylor Swift (bad joke...I know), it is all full of flavor! Make it tonight! 1. Begin browning Italian Sausage in a large pot over medium heat. 2. After about half of the meat is browned, add your onion and garlic to the meat. 3. Once the meat is completely brown and the onions are translucent, add mushrooms. 4. 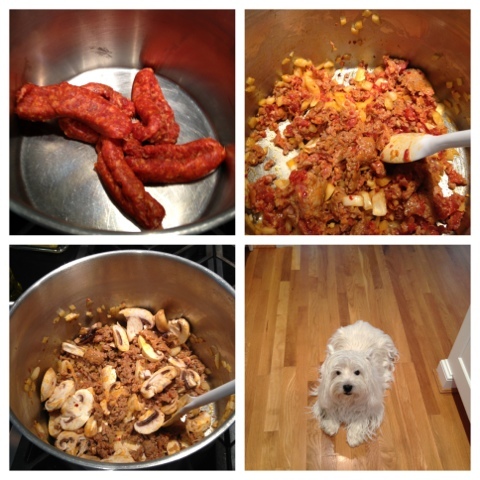 Have a cute pup as your sous chef! 5. This is the step that truly makes the sauce. Take your tomatoes and slice the top off. Squeeze the juice of each tomato into the pot. Give a good stir. 6. After squeezing the tomatoes, give them a rough chop and then add them to the pot too. Let them cook down for a few minutes. 7. 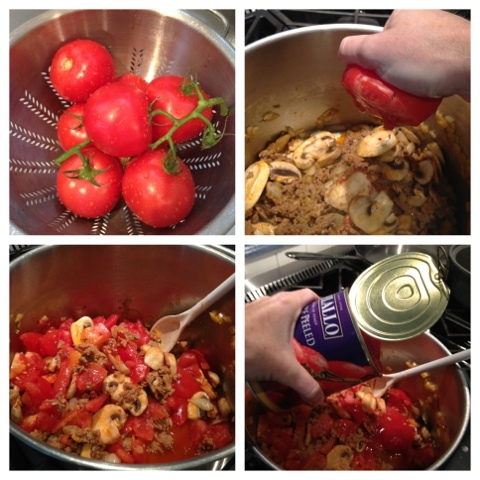 Add both cans of stewed tomatoes to the mixture in the pot. Make sure to completely crush all of the stewed tomatoes with spoon to release all liquid and to break them down. 8. Bring sauce to a boil and then reduce to a simmer for at least 30 minutes. 9. 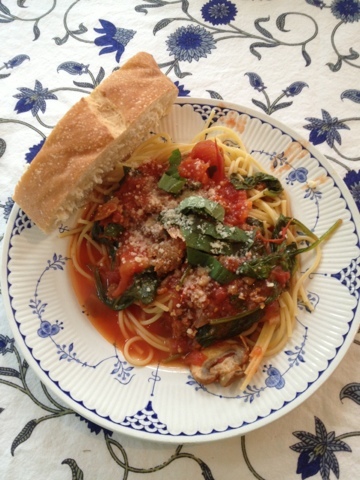 When getting close to serving, add entire bag of spinach to the sauce. Stir until it is wilted and incorporated in the sauce. Finally add about 3 roughly chopped basil leaves. You can put this sauce on anything: pasta, tortellini, or even just some oven roasted veggies if you are wanting to be gluten free. I can even eat it as a soup. It is that good! Let me know what you think and Bon Appetit! I still look up your chicken salad recipe every so often when im at the grocery store because i love it! Can't wait to try this new recipe - delicious!